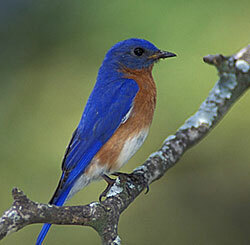 The eastern bluebird is found throughout Ohio in appropriae habitat. Some bluebirds will over-winter in the southern half of the state. Bluebirds are usually found in fields, open woodlands, parks or along golf courses or other open areas, including suburban locations with open spaces and scattered tress. The eastern bluebird has a musical flight call that often reveals its presence. Bluebirds can be attracted to peanut butter mixes, suet and fruit. Raisins soaked in hot water to soften them are well received. The bluebird's special favorite is mealworms. The eastern bluebird nests throughout Ohio in appropriate habitat. One or two broods may be produced. Three to five light blue eggs are typical. If you manage a bluebird house watch for house sparrows trying to use the next box and immediately remove any house sparrow nesting material. Here's a colorful quote on eastern bluebird courtship, also from the Bent series. The love-making of the bluebird is as beautiful as the bird itself, and normally as gentle, unless interrupted by some jealous rival who would steal his bride; then gentleness gives place to active combat. The male usually arrives a few days ahead of the female, selects what he considers to be a suitable summer home, and carols his sweetest, most seductive notes day after day until she appears in answer to his call. Then he flutters before her, displaying the charms of his widespread tail and half-opened wings, warbling in delicious, soft undertones, to win her favor. At first she seems indifferent to the gorgeous blue of his overcoat or the warm reddish brown of his ardent breast. He perches beside her, caresses her in the tenderest and most loving fashion, and sings to her in most endearing terms. Perhaps he may bring to her some delicious morsel and place it gently in her mouth, as an offering. Probably he has already chosen the cavity or box that he thinks will suit her; lie leads her to it, looks in, and tries to persuade her to accept it, but much persistent wooing is needed before the nuptial pact is sealed. In the meantime a rival male may appear upon the scene and a rough and tumble fight ensue, the males clinching in the air and falling to the ground together, a confusing mass of blue and brown feathers struggling in the grass; but no very serious harm seems to have been done, as they separate and use their most persuasive charms to attract the object of their rivalry. At times, a second female may join in the contest and start a lively fight with her rival for the mate she wants. John Burroughs (1894) gives an interesting account of such a four-cornered contest, too long to be quoted here, in which the female of an apparently mated pair seemed to waver in her affections between her supposed mate and the new rival; and the latter seemed to have left the female of his first choice to win the bride of the other. However, after a much prolonged contest, the matter seemed to be satisfactorily settled, for two pairs of bluebirds finally flew off in different directions and started up housekeeping without further trouble. Visit the main Birdzilla.com Web site for information on nest boxes, management, bluebird trails, range maps and much more on these popular birds. The Sam's Guide to Bluebirds CD-ROM and DVD provides complete information on bluebird trails, boxes, care and feeding and a whole lot more.